Love Messages for Friends: Does reading a quote on friendship melt your heart? Does thinking about your friends bring back the fondest of memories? Then why wait for tomorrow to send your friends a sweet message? Pull out your phone and text them a big xoxo right away. Post a few of your best pictures and selfies on Instagram along with a beautiful quote that defines your friendship. You can even go a bit old school by sending your friends a greeting card and a box of chocolates. Even if you talk to them on Facebook every now and then, it’s doing that extra bit which will help you express your feelings in the best possible way. Don’t need to wait for Friendship Day or your friends’ birthday, the right time to tell your friends I Love You is right now. 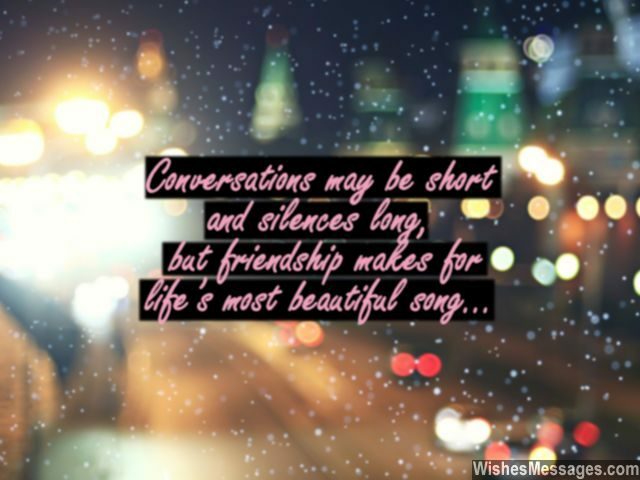 1) Conversations may be short and silences long, but friendship makes for life’s most beautiful song. 2) Our friendship is a rare type of currency. It never depreciates, it always appreciates, it is acceptable in all countries but it is available only to a lucky few friends like us. 4) Even though you are miles away from me, you seem to be closer than most of my family living in the same house. 8) We have accepted each other’s past. We’ll stick together until we last. We promise to be there for each other. That is because we’re friends forever. 9) Do you know what heartbreak and cheating have in common? They don’t exist between friends. 11) The difference between living a good life and living a great life lies in having awesome friends like you. I love you. 12) You love me the most when everyone else hates me. You believe in me the most when everyone else looses faith in me. You trust in me most when even I can’t trust myself – you are the best. 14) Our friendship doesn’t depend on being physically together, as long as we understand each other. Love you. 15) Our friendship is like a chewing gum. I can pull it, knot it, twist it or turn it any way I want – but it will always stick with me forever. I love you. 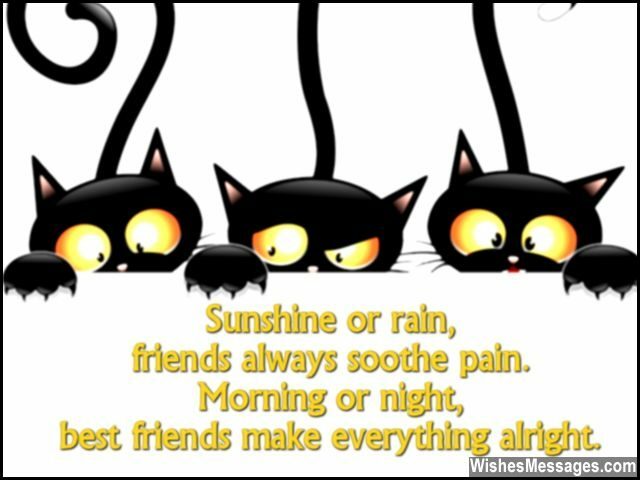 16) Sunshine or rain, friends always soothe pain. Morning or night, best friends make everything alright. 17) All my friends tell me how awesome I look when I dress up for a party. You are the only one who tells me that even when I don’t dress up for a party. 18) Our friendship is both an asset and a debt – an asset in my life and a debt that I will always owe forever. 19) The cute bond of our friendship isn’t measured by the number of gifts, Facebook likes or text messages. It is measured by the number of hugs, smiles and winks. I love you tons. 20) Friends like you are completely low maintenance. No expensive gifts, all you need is love and affection. 21) I hate Friendship Day because all your other friends wish you too. I want an exclusive Friendship Day for just me and you, when I can tell you how much I love you. Thanks for being my friend. 23) Just imagine how amazing a bowl of hot chicken soup feels when you are suffering from cold. That is how I feel when I spend time with you. 24) People help me by giving answers to the questions I ask. You help by asking what the problem is. 25) Friends are the cushions which break life’s bitter falls. 26) I don’t believe in BAD luck, because I have GOOD friends like you. 27) With you, I can be honest and lay my heart bare. Nothing else can come close to the beautiful friendship we share. 29) I am high on my success today only because our friendship has taken me higher in every way. 30) Some people come, some stay and others go away. But friends like us stick together until troubles are at bay. 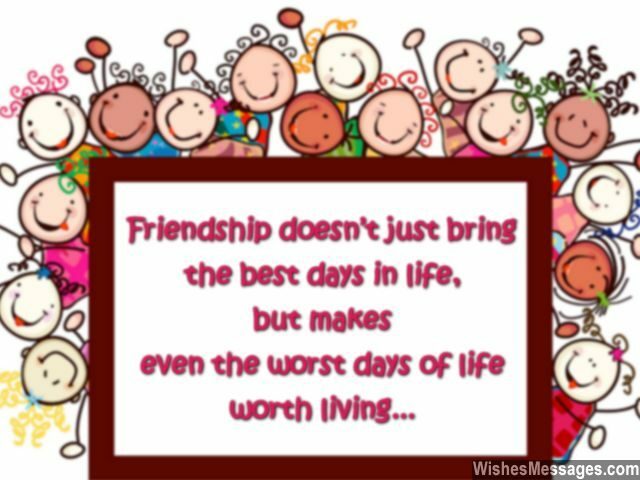 31) Friendship doesn’t just bring the best days in life, but makes even the worst days of life worth living. 32) Who said memories are always pretty and beautiful? Even the darkest of moments in life become memorable because of friends like you. 33) People will ask you to lighten up and stop crying. Friends will give you their shoulder to cry on. Love you. 35) Friends say ‘Don’t worry, everything will be fine’. Best friends say, ‘Don’t worry, we’re in it together’. 36) Best friends do all the wrong things together with great gusto and enjoy its consequences with the same spirit. Thanks for being my best friend. 38) You are the kind of friend that life needs to give everybody, so that even they understand how beautiful life can really be. 39) Even a million friends on Facebook < YOU.